A summary of today’s show: Fr. 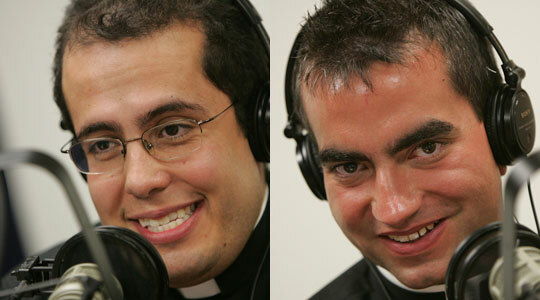 Carlos Suarez and Fr. John D’Arpino talk with Scot and Fr. Chris about their first weeks as newly ordained priests, their experience of the ordination Mass, celebrating the first Masses, and moving into their new parish assignments. Also, their own journeys of discerning their vocations to the priesthood. 1st segment: Scot welcomes Fr. chris back to the show. He has been looking forward to this show since May 21 when 6 men were ordained for Boston. Fr. Chris has been to other ordinations as well, including the Dioceses of Worcester and Springfield, where men who studied at St. John Seminary will serve. On Friday, they also had a catechetical certificate graduation. The program educate catechists to know more about their faith in order to work in parishes and share the faith. In Scot’s experience, when a newly ordained priest is assigned to a parish, it re-energizes that parish. Fr. Chris said it’s a reminder that the Church is ever ancient and ever new, always young. On Pentecost, we’re reminded that the Holy Spirit re-energizes us. That your first love is your greatest love is true for priests as well: There will be no parish like their first parish. 2nd segment: Scot and Fr. Chris welcome Fr. Carlos and Fr. John to the show. Scot asked Fr. John what it was like during the ordination ceremony after his years of formation. Fr. John said during the moment when Cardinal Seán asked him to pledge his obedience was a highlight for him. He remembers how peaceful he was during the whole ordination and was able to pray. The one moment that sticks out for him is the prayer that the priest prays during the Lamb of God and he suddenly realized he needed to say it. ALso during the Litany of the Saints, it touched him to think of praying with everyone in the cathedral, but also everyone who has come before. Scot asked what it’s like to lay on the floor before the altar during the litany of the Saints. Fr. John said it’s a humbling experience to receive those prayers of all the people. We are unworthy, but we accept it as a gift from God. Scot asked Fr. Carlos for his brightest memories of the ceremony. He said the imposition of the hands by all the brother priests was a powerful moment. He felt the communion of the priesthood as each one prayed for him. He felt a fraternity and affection from each of them. Fr. Chris asked Fr. Carlos what he was thinking about as he headed to the cathedral. He said it was overwhelming in prayer to think about all the graces he was receiving from God. The concentration on the logistics of the day helped to put aside the stress and just enter into the Mass. Scot said the closest equivalent for laypeople was their wedding day and many of them have to stress over details. Fr. John said he was lucky that he didn’t have to deal logistics. He just had to show up at the cathedral and then the reception. Being on retreat for the week right up to the ordination helped him to focus on the most important part of the day. Fr. Chris said one of Cardinal Seán’s gifts is preaching his homilies. Fr. Carlos said the Cardinal capitalized on the news about those who expected the Rapture and end of the world that weekend. He started with some humor, but then talked about how the Mass is a rapturous experience for people. Fr. John said he liked how the Cardinal talked about the upper room, the place of the Last Supper but also where the Apostles and Mary were gathered for Pentecost. It was a reminder that the ordination is an outpouring of the Holy Spirit. Scot asked Fr. John if there was anything about the ordination that surprised him. He was surprised at the amount of joy from the other priests during the Sign of Peace, even from priests he’d never met. It struck him that they are a family and now brothers in the priesthood. Fr. Carlos said he didn’t expect the impact of things, especially during the prayers of consecration, recognizing the awesomeness of the moment,. Fr. John chose Fr. Brian Kiely from St. Patrick, Natick, who was his pastor during his assignment to the parish over the past two year.s It was a recognition of his love for the priesthood and that he is one of the best priests he knows. Fr. Carlos chose Fr. Michael MacEwen from Immaculate Conception, Marlboro, for similar reasons. Fr. Carlos had a lot of family fly into Boston from across the country, which was a great gift for him and a support to him in his vocation. 3rd segment: SCot asked Fr. Carlos when he first heard his calling to the priesthood. He knew from the time he was six that God was calling him to be a priest. He would come home from Mass and play at being a priest. As he grew up and the immensity of God’s calling was daunting and he started to push back. He looked into other interests and other fields of study. Around the end of senior year of high school, his faith life took off. The next year he went on a vocation discernment retreat and there was a great sense of peace and a sense of coming home. He explored both religious life and the diocesan priesthood. He graduated from Boston University in 2003 and entered seminary after. He had initially looked at the Salesian order because of his great love for youth ministry, but God made it clear that He wants him to live it through parish life in the Archdiocese of Boston. The Salesians are great, but it was clear God wasn’t placing him there. Fr. Chris asked Fr. John about whether he looked into religious life. Fr. John had been exposed to the Benedictines during college and looked int o that life, but realized that he wasn’t called to the monastery. He had a sense of giving back to the Church in Boston, which had given him so much of his faith. His vocation began with serving daily Mass in his parish in Lynn and that’s what led him to entering the diocesan priesthood. He attended BC High and the retreat experience they offer there helped him. It’s a weekend retreat in which the retreat team shares how God has worked in their life. They are encouraged to bring the prayer experiences of the retreat to the rest of their life. Faith became personal and not just a set of rules. Fr. Carlos did not go to any Catholic schools. Scot asked how attending secular schools helped him. Fr. Carlos said one of the great gifts at BU is the Catholic Center. At a secular university, living Catholicism must be an intentional act. It made the faith come alive. Belonging to a community helped strengthen him in his discernment of his vocation. Fr. Chris asked what other priests have been influential. Fr. John said his first pastor, Fr. Ed Malone, was a model of loving the priesthood and serving the people of the parish. The Jesuit priests at BC HIgh radiated the love of Christ. The monks of St. Anselm College were witness of joy and hope and helped him see Christ in his life. Fr. Carlos said there were many pastors, but the pastor of his parish growing up in East Boston was Fr. John Kilmartin, who died about 1-1/2 years ago. In the midst of his suffering, he served the people with joy. Scot asked about the final years of discernment at the seminary. Fr. Carlos said his first 15 minutes at the seminary led him to ask, What am I doing here. But as the years went by he felt a great joy and peace that he was doing what God called him to do. Fr. John agreed with experience. He found joy in growing into this idea of being father to the people he was serving. Fr. Chris said that there’s a saying that every priest has one homily he preaches. Fr. Carlos said the basic message he wants to convey is the message of hope. People are often seeking joy and peace in so many other things. He hopes others find the real peace and joy that God wants. Fr. John said he preaches on the fact that we have hope because God loves us in a personal way. In that love and hope, we can find help and grace through any difficulty. 4th segment: Fr. John said Cardinal Seán’s homily reminded that the priest at Mass is both Priest and Victim. He is the sacrifice and the one who offers the sacrifice. Fr. Carlos said his first Mass was at his home parish at St. Joseph-St. Lazarus in East Boston. Being the celebrant at this altar was a beautiful moment that he’s still trying to process even 2 weeks later. He asked Fr. Bob Oliver to preach at his first Mass, who had been his faculty adviser and a professor at St. John’s and a role model of the priesthood. Fr. Chris asked Fr. John about his first Mass. He said during the elevation he was struck by how real the moment was, unlike any of the practices Masses he had done. He was blown away to think that he held the Creator of the Universe in his hands. And then after distribution of Communion, sitting back in his chair, to be at peace and be amazed at what just happened. Scot asked what it’s like to be the principal celebrant at your first Mass. Fr. John said it’s a blur, but he was absolutely present. He was nervous and wanted everything to be right. But he was able to present to it and can now recall it and look back on it. Fr. John said Fr. Peter Fournier, a recently ordained priest from Fall River who is a friend. Scot asked Fr. John about his new assignment. The pastor at St. Thomas Aquinas is new so Fr. John is moving in on June 17. But he did meet some parishioners at the ordination Mass. He was also at freshman orientation at Bridgewater State University yesterday, which is part of his responsibility. Fr. Carlos was assigned to three parishes. He’s finished his first week. He’s one a 3-week rotation of the parishes each Sunday. He said it’s amazing how the Holy Spirit has helped him work in three parishes. He finds the people warm and welcoming. Scot asked him about the sacramental work: He’s heard confessions and done anointings and celebrated daily and Sunday Masses. He enjoys meeting people after Mass and getting to know them. Fr. Carlos said there are 4 main languages in his parishes, including English, Cape Verdean Creole, Haitian Creole, and Spanish. Fr. Carlos speaks English, Spanish, Portuguese, Italian, and Arabic. He hopes to learn the Creole languages. He’s learned that Brockton is a diverse and energetic place, especially among the youth. There is a lot of energy in the parishes. Fr. John said he was thrilled to be able to do college campus ministry. It’s a real sign of how important it is to help young people. They’re not just the future of the Church; they are the present of the Church. Fr. Chris asked about their favorite saints. Fr. Carlos said St. John Bosco for his zeal for youth and St. Maximilian Kolbe for his martyrdom in which he gave his life for others. He said he hopes to inspired by the notion of the idea that his life is to be sacrificial on behalf of his people. Fr. John said he is inspired by St. Ignatius of Loyola for how he was a soldier, but then he was drawn to his faith; St. Maximilian Kolbe, having been to Auschwitz himself and to think of being at the site of martyrdom and to see how Christ animated his priesthood. Fr. Chris said he is inspired by St. Therese of Lisieux, finding the way to love in all that we do. Loving the Lord and your neighbor in such a way as it’s found in the little things we do every day. Also, Bl. John Paul II, is fortitude, courage, and intelligence. And St. Francis of Assisi, in his willingness to give of himself and to point to the beauty of the natural world. 5th segment: Scot asked Fr. Carlos how he has experienced the Holy Spirit in a new way. Certainly, the celebration of the Mass, but also in his acting as a priest. In his preaching, he sometimes feels that God is working through you to touch someone’s life. Scot asked Fr. John what advice he has for men listening to the program who are discerning God’s calling. He said that no matter what you are called to there will be challenges and don’t be discouraged. Develop a habit of prayer. In listening to God’s calling you in your heart through silence and attention, you can be sure it’s God calling you and not your own will. How do we try to pray in a busy life? The most important thing to do is to set time aside. If you want to be serious about it, then make the time. Set aside a space in your home that is set apart for prayer. Go to a Church to pray. Read Scripture and ask God to speak to you through it. Fr. Chris spoke of the promises that the priests made, including the gift of celibacy. Fr. John said it’s a reminder that it’s an image of Christ himself, who lived a life of poverty and obedience and chastity. The priest takes on that image of Christ. It reminds us that in heaven there is no giving and taking in marriage. By being celibate, the priest shows our future in heaven. Fr. Carlos said every vocation requires a sacrifice. In marriage, we pledge exclusivity to one person. In priesthood, the Church is his bride. The people of the church are his spiritual children. That desire is fulfilled through a sacrifice to God. If God is calling you to do something, then he will fulfill you in everything you do. Scot added that praying to God for grace in anything that comes into our life is fruitful. We don’t go alone; we have Jesus and the holy Spirit to help fulfill us. Fr. Carlos said we don’t have to do it alone. God gives us the grace to live out the vows He’s invited us to take. His advice for those discerning their lives is to not be afraid. If God is calling you, then that is what will give you the greatest happiness in life. That is what will most fulfill us. Offer your natural fears to God in prayer and you will see fears settled and joys unfold. Fr. Chris echoed the advice not to be afraid. He said entering the seminary is not making a lifetime commitment. Seminary is for coming and seeing if God is calling you to the priesthood.